Employ these services to help you see what people are saying about your brand online. Social listening has been a major marketing strategy in the recent years, but primarily for larger brands. It's not that smaller businesses didn't need it -- the price point just didn't make much sense for what they'd receive. But today, things have changed. Tools have not only become more affordable, but the number of active social media users has grown tremendously, almost at a faster rate than people getting new mobile phones. The kind of data that is available now is massive and overwhelming. There are a lot of reasons behind the growth. Facebook and Twitter are getting into the original TV and broadcasting battle. Publishers and media companies have focused heavily on social sharing from their websites. More businesses are getting hip to social media marketing. And, the young are getting older, able now to not only own phones, but also access social media sites. With this new influx of usage, measuring social activity has become an art as much as a science. People are using social media so much so that they probably don't realize they're using it to voice an opinion, share news with friends, read reviews on new places, etc. As a small business owner, you need to see what these conversations are about. Not only do you need to see your brand mentions, but online conversations are a gold mine of new data that could provide valuable insight for future strategies. Here is a list of some top social media listening tools you can sign up for, all varied in pricing and features. We all love free stuff, right? One of Google's most beloved and yet underappreciated tools is Alerts, which sends you an email of automated search results for whatever keyword you're looking for. You can set up alerts for up to 1,000 terms and have the results emailed to you daily, weekly or whenever a new results occurs. But you get what you pay for. Google Alerts only does searches on sites that get crawled by Google. So, there may not be as many Facebook results, hardly any LinkedIn, Pinterest or Instagram results and a spackling of Twitter results. There's also no sort of data visualization or collection either. This tool is all-around a reliable, inexpensive, feature-packed option for business of all sizes. Starting at only $79/mo for up to 5,000 mentions, you can set up alerts not only for mentions of your brand name, but also your competitors' and other search terms. If you're a soap maker, maybe you'd want to set up alerts for your brand name, a local competitor, local markets accepting new vendors, any mentions of favorite scents and more. You can also run unlimited content and influencer searches, so you can find ideas for new articles that are related to your business and social media influencers who may make sense for your brand. If you're flying solo or just looking for a lower commitment than above, this tool may be for you. 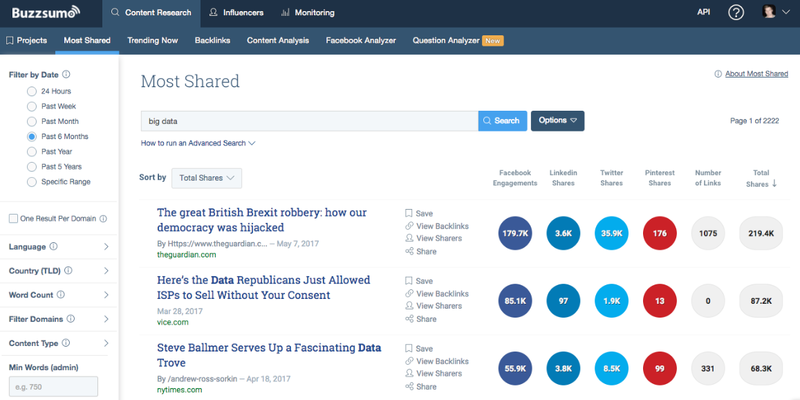 Starting at just $29 per month for up to 3,000 mentions, Mention does a lot of what's covered above with BuzzSumo. The higher tier you go, the more features you unlock, like Sentiment Analysis (measure how positively people are talking about your brand online), Automated Reporting (send regular emails and reports to the people who need to know), API access (pipeline information to other compatible programs and tools) and much more. One interesting feature is Crisis Management. It's for brands who may have an online reputation risk so that you can find and reply to any message that may appear during a certain brand crisis. This tool is like the Swiss Army knife of social media tools. Its main feature is scheduling and publishing across multiple social accounts, but it also comes packed with analytical, search and data visualization features that will definitely be of help to anyone handling social media monitoring in your company. 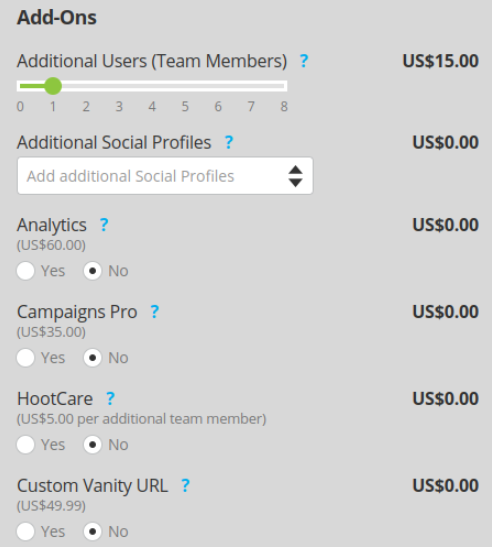 Hootsuite is free to use, but if you want to access all the essential features for monitoring social media, then you'll need to upgrade to at least the Pro or Business tiers. Both are $5.99 per month and $499 per month respectively. If $499 is too much of a commitment, you can opt for the Pro plan and add other features a la carte to your plan. The Pro plan allows you to publish and schedule to 50 accounts, but offers only one Enhanced Analytics report. Below you can see the different features you can add on monthly to your plan. It's important to note that Hootsuite's customer service is likely what sets it apart from other tools. They're quick to respond and their staff is knowledgeable and friendly. If your business strategy is to work with influencers, then this tool may be best suited for you. Starting at $179/mo, Keyhole does all the basic reporting and monitoring of social media activity, but it also allows you to not only search for influencers, but pull reports on their activity, too. As of right now, you can't really get much insight from another person or competitors' social media data. But, Keyhole will allow you to attach certain accounts that you want to gain data access to, so you can see how influential these influencers and their campaigns are. 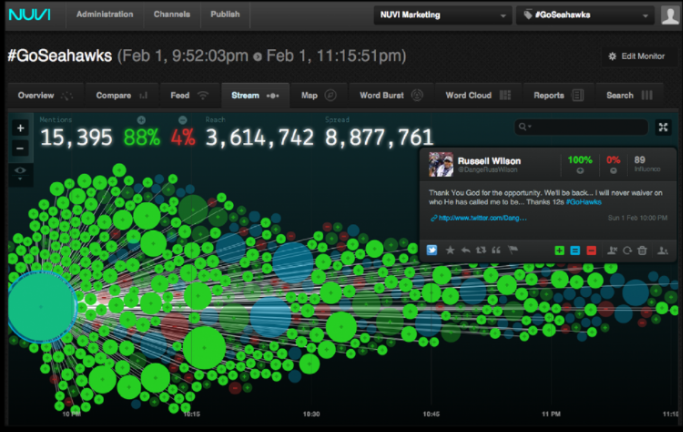 If your marketing needs exceed than what's been mentioned so far, then you'll need a more sophisticated tool like Nuvi. Getting pricing from them depends on your unique needs, as their ethos is that you only pay for what you want. But, rumors around the web state that the tool starts at around $300 per month. No matter what tool you decide to use for monitoring your brand online, keep in mind that it's up to you to make data go from informative to actionable. Respond to those online mentions, regardless of whether it's a positive or negative comment. Look for trends that may inform your next marketing campaign. Find ideas for a new product or service that you can provide. Of course, all of this starts with having your own solid social media presence. If you're unsure if your accounts are up-to-date and optimized, social media audits are available to help you determine where your strengths and weaknesses are. Did we miss any mentioning tools? Let us know of your favorite ones in the comment section!